Safe communication affects every level of your system. You can rely on our drive solutions with safe communication that is either integrated or can be expanded as part of a modular system – in both central and decentralized installation concepts. 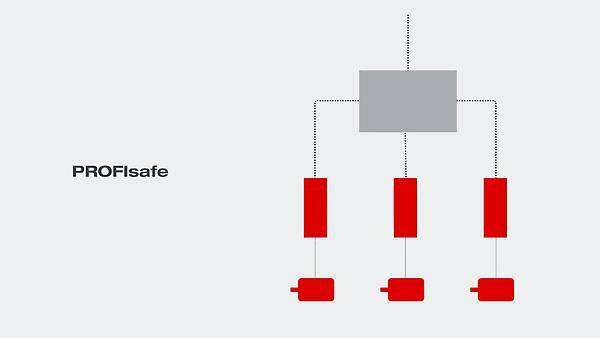 The PROFIsafe profile is currently synonymous with safe communication: It gives your systems and automation concepts the functional safety you want and need. All of our drive components, both mechanical and electronic, speak the “PROFIsafe” language. The components speak this language between themselves and also for communication with the control level. Therefore, place your trust in the technology of one of the world’s leading manufacturers of drive technology and make use of the communication capabilities of our components. You can do this whether your machine or system is installed centrally or decentralized. And of course, it also available worldwide. Our experts know your industry and its requirements. Our global network ensures we are there wherever and whenever you need us. We have the expertise and the tools to provide optimum support and advice. in central and decentralized installations thanks to drive technology with safety options that are either integrated or can be expanded as part of a modular system. between all levels of the system architecture as well as between the actual drive technology components. Safe communication can be used horizontally as well as vertically in all machine and system structures, regardless of whether it is for central or decentralized installation concepts.